As I was driving along an interstate in central Washington, I ran across…. Unfortunately, there was no destruction, fire breathing lizards, weblogs, or open source web browsers. Just a little town. 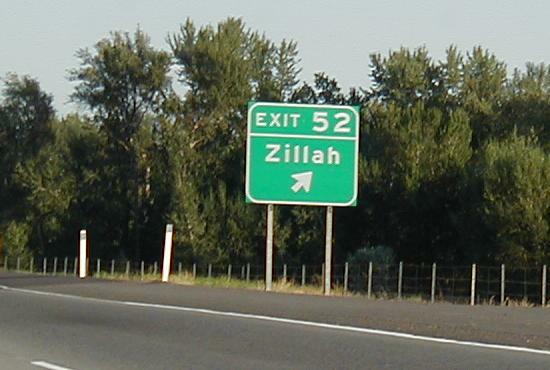 Hey, my paternal grandparents retired to Zillah. Spent a couple of weeks there one summer. Nice place, if you like the whole Eastern Washington bake/freeze cycle. When we drove through friday afternoon it was about 95 degrees. We didn’t really notice till we stopped for dinner, as the wind chill from 70mph in a convertable keeps it nice and comfy. The land out there has a baked quality to it. Golden brown, sort of hard and toasted. It’s a nice place, but I don’t think I’d want to live there.